100 – Who’s Gonna Fly It, Kid, You? 104 – What Do You Mean “Nobody Knows”? 200 – You’ve Switched Off Your Targeting Computer, What’s Wrong? This is the first post in a series that will analyze the meta in the NoVa region. This is based on data collected from 63 games played in 3 tournaments at 3 stores in the area in the last week. In coming weeks, more stores and tournaments will be added to the data, and new charts will become available. This is not simply a compilation of all the squads out there. Instead, the data has gone through a highly sophisticated, proprietary grind in order to shake out not merely what people are playing, but what’s winning. This is a guide for what you should plan to beat. Also, I know I’m not great with charts. I’m just the analysis guy. We don’t have a charts guy. In the future I’ll work on providing something more elegant. Click on the charts to get the larger version. 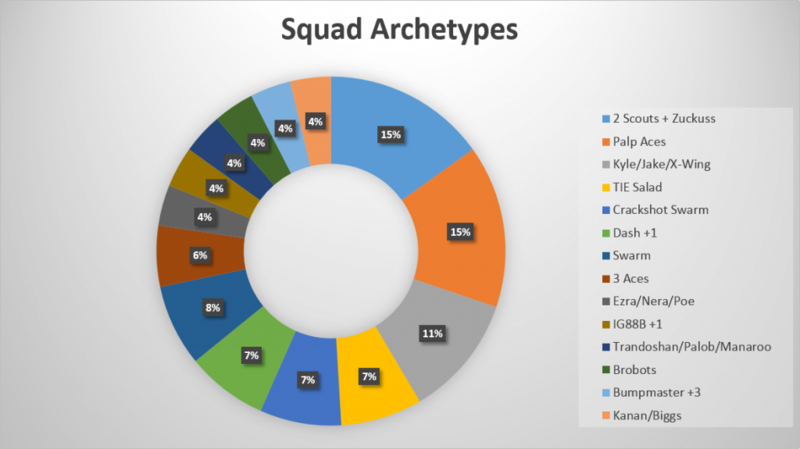 The first chart breaks down squads by their archetype when one exists. Occasionally an oddball gets into the mix that doesn’t fit into a type; deal with it. The “+N” on a list indicates the number of additional ships in a squad. TIE Salad is Ben K’s Roanoke championship squad. 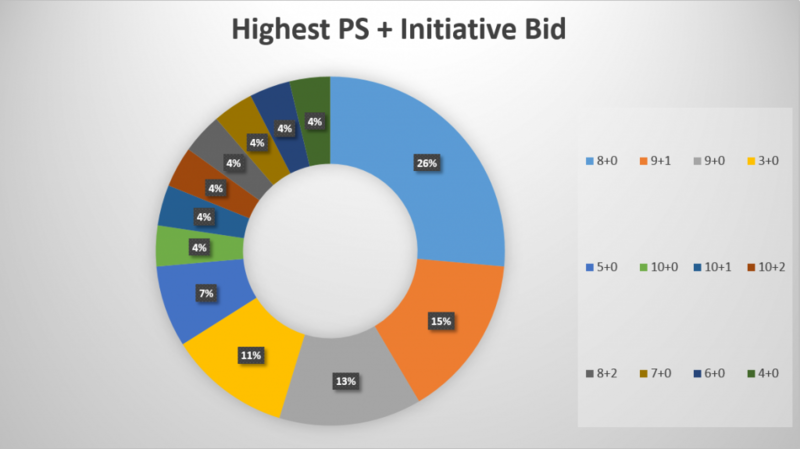 This is a chart showing the highest Pilot Skill ship in a squad, plus that squad’s initiative bid. Should be self explanatory. 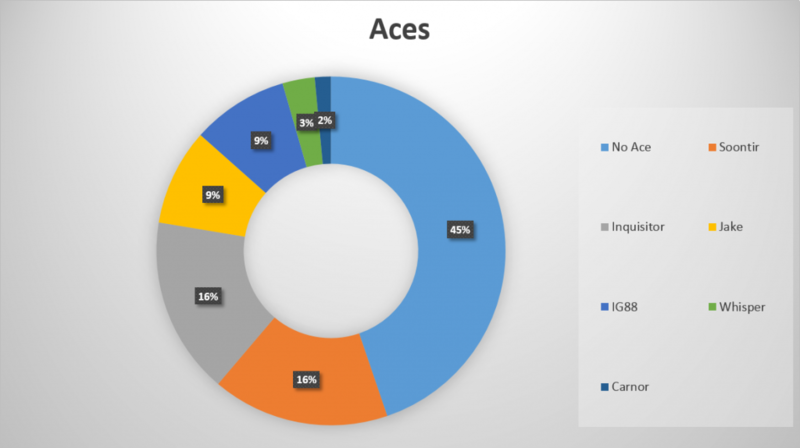 These are the aces that are appearing in winning squads. Ace is more than just high Pilot Skill. For this chart, I’ve looked at a combination of high Pilot Skill, arc dodging, and modified green dice. So, ships like Poe and Dash do not make it on, despite Poe’s high PS, and Dash’s ability to arc dodge. If you’re worried about those ships, hopefully other charts will provide you with the data you need. Why isn’t Poe included in the Aces graph? High Pilot Skill (8-10 check), arc dodging (boost check), and modified green dice (auto-thrusters check). It just seems odd is all. I mean I will live without having him part of the graph I’m just curious where he falls short. Poe is a close call here, but he’s only got 2 green dice, no evade action, and no barrel roll. Most every squad can put damage on him without having a specific plan for dealing with Poe. Ships like Soontir or Brobots are much tougher if you’re not prepared for them. That doesn’t make him “not an ace.” Arbitrary. This isn’t about being careful not to hurt Poe’s feelings. It’s about information that’s useful for planning your squad and general strategy. Poe poses a different kind of problem for players to deal with than the other ships. Maybe he’ll get included later on, but for now he’s going to remain excluded. If you’re worried about facing Poe, what you should most look at are lists with PS10 pilots, and their init bids. I like how the OP’s original definition of an “ace” is high PS, green dice mods, and arc dodge capability. Also, leaving out triple Jumpmaster, the list that singlehandedly ran TLTs out of town and shifted the meta completely. Poe has a high pilot skill, but not enough arc dodging, and not enough green dice (plus mods). Same reason why Howlrunner isn’t on the list. As for triple U-boats, they don’t appear because they did not actually appear at the tournaments this data is from. Love this. Interesting that triple U-Boats aren’t on the chart, and that so many people are running Zuckus + 2 jumps. This is still a pretty small sample set, just 63 games, and 44 players (not unique players). I’m sure we’ll see triple Us make the charts in the coming weeks. This is pretty great, frustrating to see people complaining about free data provided in easy to understand graphs. I look forward to any updates provided.